Last week a friend of mine asked me, “What do you think of Zengo for dinner”? He had been there for lunch, but never for dinner. I had been to Zengo for dinner almost 3 years ago and could not remember much of a positive experience from that visit. I vaguely remembered that vegetarian options were limited. To respond to my friend, I had to take another look at Zengo’s menu. 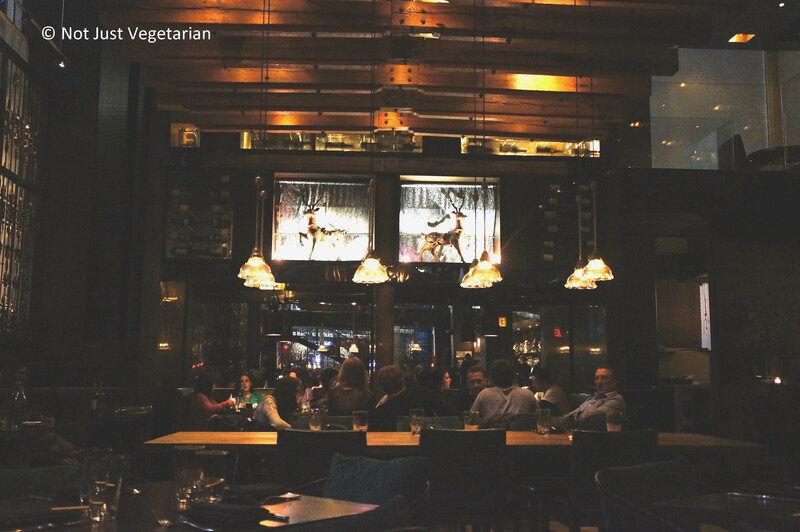 This time I noticed that the restaurant served Latin – Asian cuisine which I did not remember from before. There were many vegetarian options too. My friend, who had asked me about Zengo, made a reservation for a group of us to head there for dinner over the weekend. 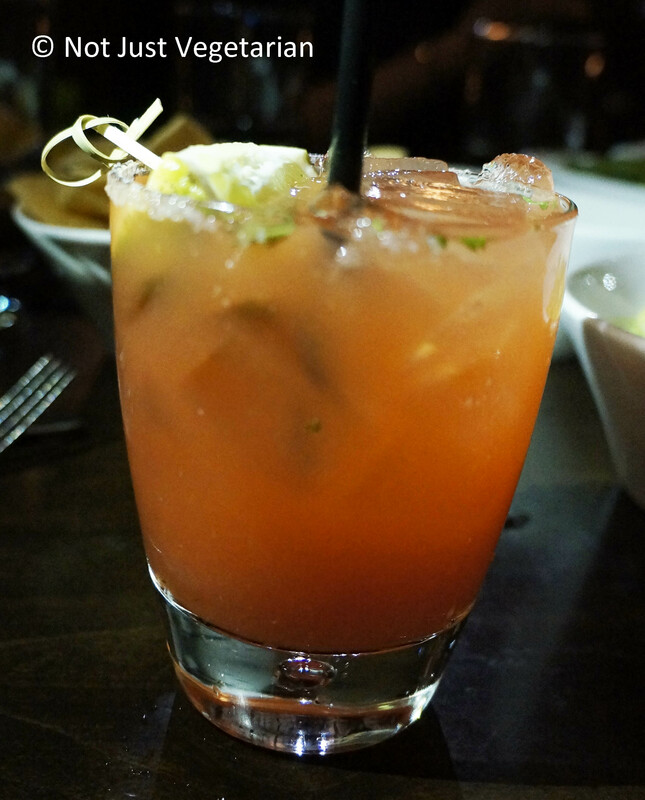 Between us, we got the Zengo Margarita, the Cucumber Serrano Martini, and the Tamarind Tequila Togarashi Margarita. My friend’s approach to choosing a drink is: “If a restaurant serves a signature drink, it will be worth getting”. After this experience, I am inclined to follow his approach. 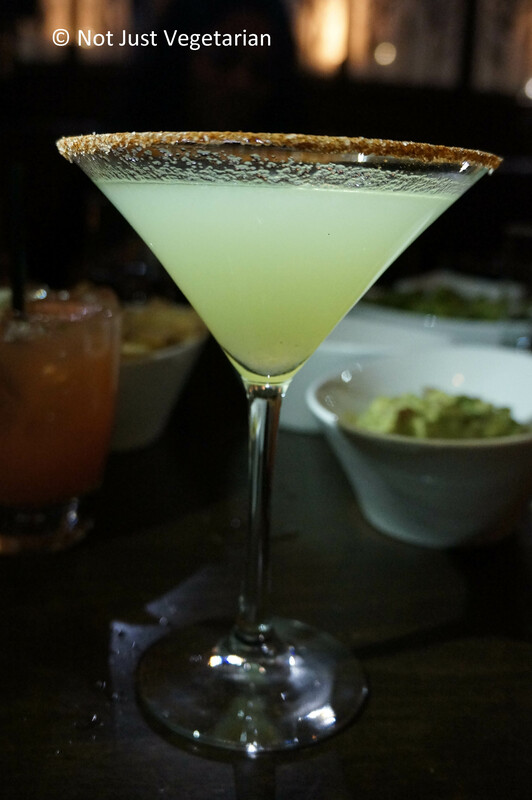 The Cucumber Serrano Martini was a beautiful green drink in a spice-rimmed glass. I found this underwhelming although another friend loved this drink. 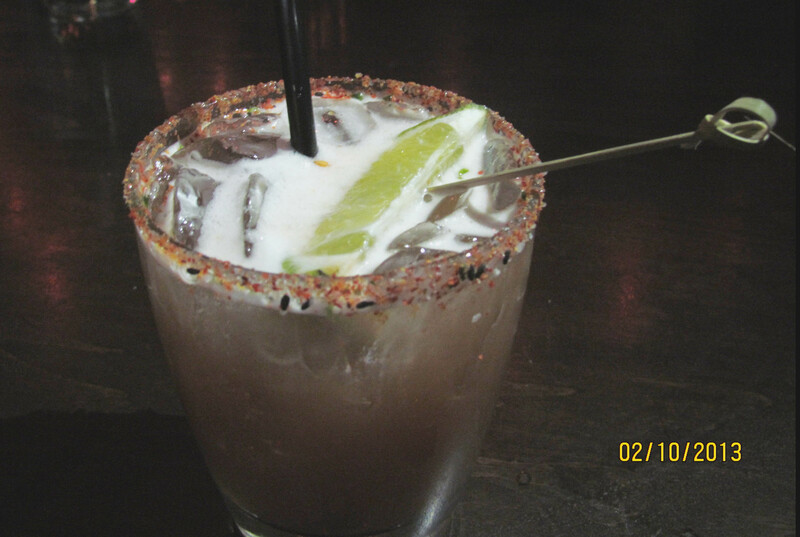 I find it hard to appreciate mezcal as a drink, and I found that the spice on the rim could have done with some salt to make the drink more balanced. The Tamarind Togarashi drink was my next favorite. This drink was sweet, sour, salty, and spicy at the same time. Another must-order drink at the restaurant. Zengo is a large restaurant. 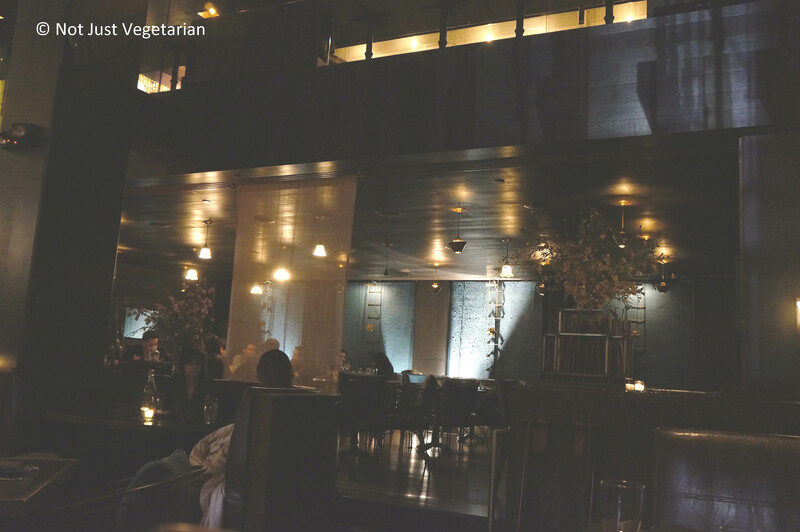 Here are some pictures from inside Zengo – to give you a sense of the size and decor. We got some edamame, guacamole (medium spicy), the vegetariano roll, the piloncillo green salad, the beet salad, the crispy tofu, the angry Zengo roll, a vegetarian fried rice, the shrimp vegetable potstickers, and the sorbet trio; we shared everything. Some of the dishes (e.g., edamame, guacamole, vegetarian fried rice) met expectations. I am writing only about the highlights and let-downs at Zengo to keep this post (relatively) brief. The highlights: The highlights of the dinner were the two salads, the angry Zengo roll, and the sorbet trio. 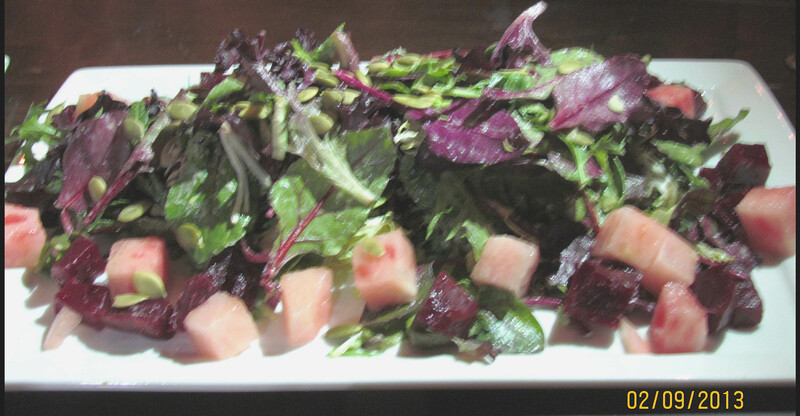 The beet salad had some watermelon pieces that did not look pretty but the watermelon along with the candied baby beets added welcome bursts of sweetness to balance the balsamic on the mixed greens. The pumpkin seeds added a nice crunch to the salad. I could taste more of the miso in the miso-cotija vinaigrette. 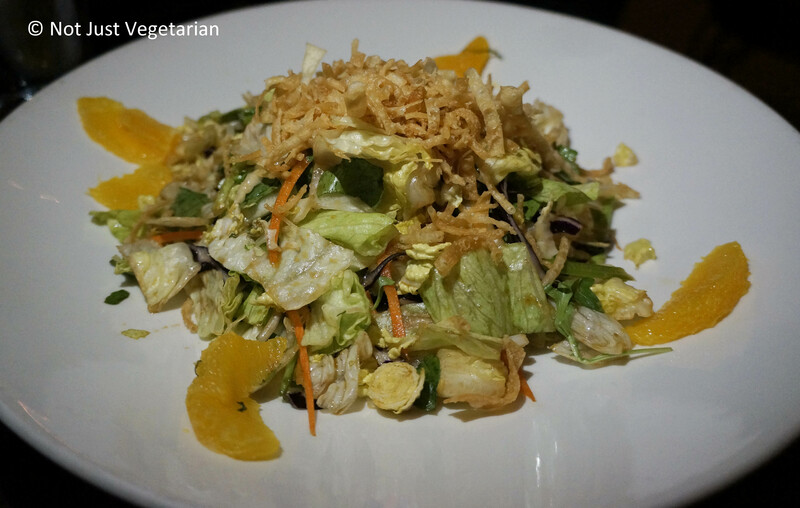 This is a must-order salad at Zengo. The piloncillo green salad was definitely worth ordering. When I ate this salad, I had no idea what piloncillo is. Turns out that its unrefined sugar from sugar cane juice and is usually made in blocks. The closest this ingredient comes to anything I know in Indian food is jaggery. To be honest though, I could hardly detect the piloncillo in the piloncillo- ginger vainaigrette, although the salad tasted delicious. I loved the crispy wontons with the fresh shreddded cabbage, mildly sweet orange slices, and the mildly spicy togarashi pecan. The angry Zengo roll had a delightful combination of spicy yellowfin tuna, wasabi tobiko, sesame, avocado, cucumber and green onion. The reason this dish / roll was a highlight of the evening was the chipotle rouille – a delicious combination of chipotle chiles in oil, egg, honey, lime juice, and water. See Richard Sandoval’s recipe of the chipotle rouille here. 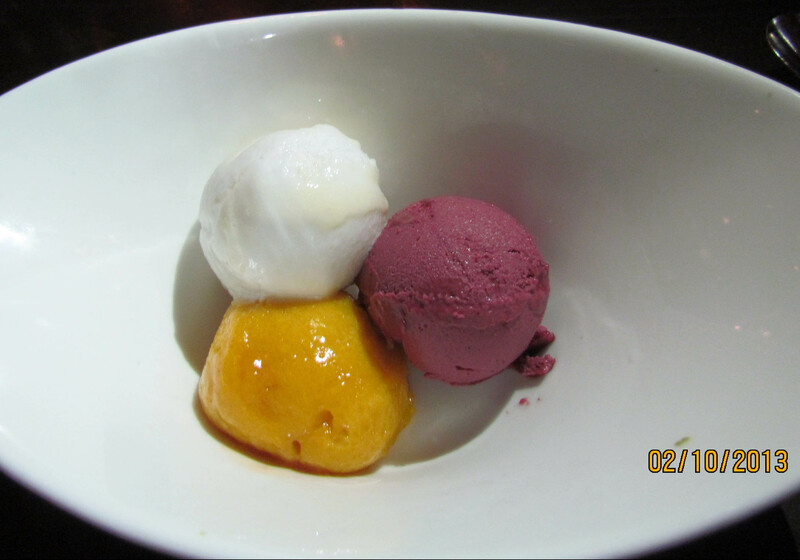 The sorbet trio of mango, raspberry, and coconut was simply delicious. The mango sorbet was super fresh, almost as though I was eating frozen mango juice. This sorbet is comparable to the mango “ice cream” from Natural in India for its freshness and authentic flavor (I know, I know a sorbet and an ice cream cannot be compared – that is like comparing apples and oranges, oooops, excuse the pun!!). Despite not being a mango-lover (yes, my Indian family can’t understand that), I can claim that I have had the best mango sorbet in NYC. The raspberry sorbet was fresh as well. I was not impressed by the coconut sorbet, although my friends were happy to enjoy it. The letdowns: The letdowns of the evening were the shrimp vegetable potstickers and the crispy tofu. 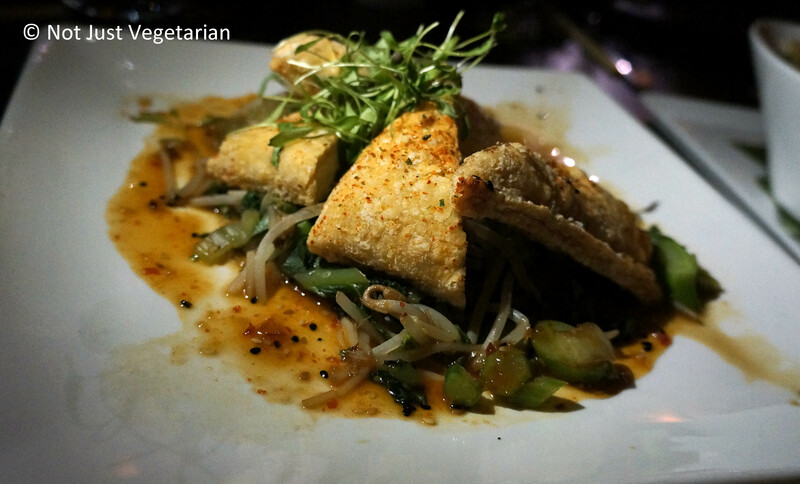 The crispy tofu was promising on the menu and looked extremely appetizing too, but was way too dry, bland, and chewy to enjoy. The bean sprouts, ginger, cilantro in the sesame-chile sauce beneath the tofu was great, but could not make up for the bland tofu. 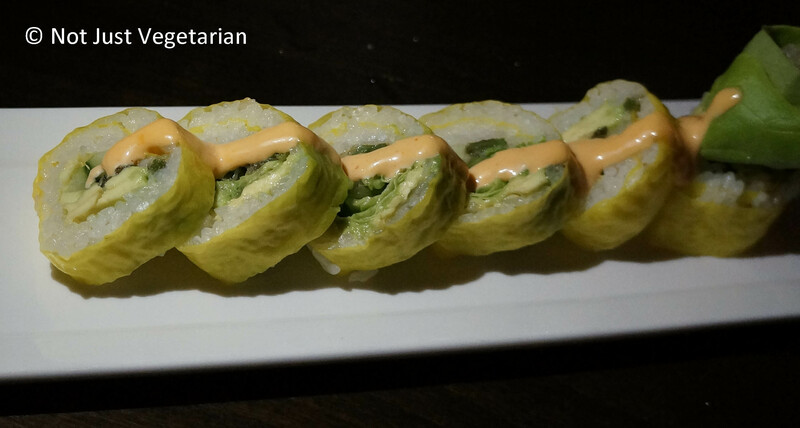 Get this vegan dish if you do not have other vegan options. 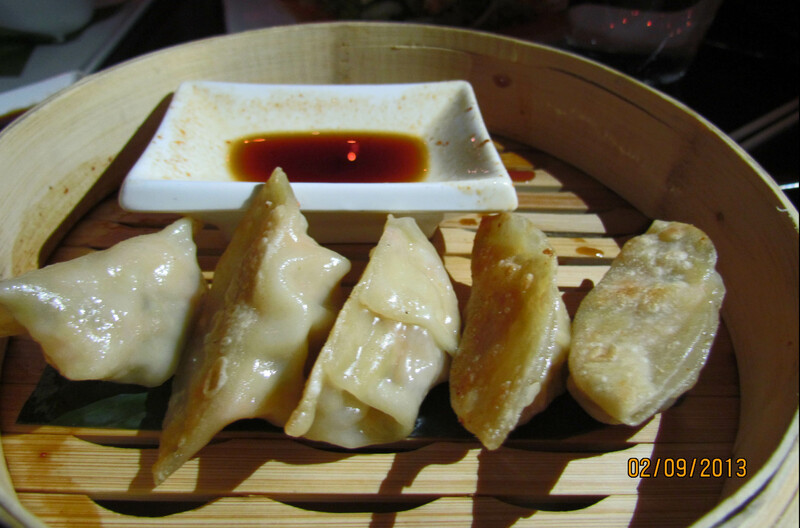 The shrimp vegetable potstickers were again too dry and bland. I think I have a problem with potstickers in general. I always find the cover too dry and flavorless. The dipping sauce and the filling typically make it worth the while to order this dish, but in this case, neither of these made up for the tasteless cover. The server was very thoughtful and gave us an extra bowl (more like a couple of tablespoons) of chile dashi broth, but then again, that did not help. Overall, my take on Zengo is that the restaurant shines best in it’s Latin dishes in its Asian ones, although the Asian dishes are not bad. Why would you go to Zengo? The crispy tofu and the mango sorbet were the best dishes…great evening at zengo !